Overall, support for suicide bombing, having declined substantially over the course of this decade among a number of Muslim publics, has not fallen further in the last year. Among the Muslim populations surveyed, support for suicide terrorism is limited, but with one key exception: the Palestinian territories, where a solid majority endorses such attacks. 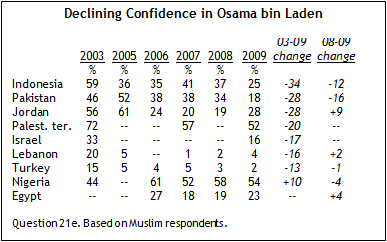 Pew Global Attitudes surveys have also found decreasing support for Osama bin Laden over the last few years. Here again, there has been little overall change in views about bin Laden since last year, although support for the al Qaeda leader has declined in both Indonesia and Pakistan. On this measure Palestinians are again outliers along with Nigerians: In both countries slim majorities of Muslims have confidence in bin Laden to do the right thing in world affairs. A third finding from the current survey is also consistent with previous poll results –among the publics in Muslim nations, there is widespread concern about the rise of Islamic extremism, both within their own countries and in the world more generally. With the exception of the Palestinian territories, majorities or pluralities in each of the Muslim publics included in the survey say that suicide bombing and other forms of violence against civilian targets can never be justified to defend Islam from its enemies. Nonetheless, there is significant support for such attacks in several nations, and the vast majority (68%) of Palestinians believe these tactics can often or sometimes be justified. Only 17% of Palestinians say they are never justifiable. While solid majorities believe suicide bombing can often or sometimes be justified in both the West Bank and Gaza, the intensity of support is especially strong among Gazans, 52% of whom say attacks on civilians are often justified. There is also considerable support for attacks against civilians among Nigerian Muslims (43% often/sometimes justified). Lebanon is the only other country in which more than 15% endorse these attacks – 38% of Lebanese Muslims say they can often or sometimes be justified. Relative to other Muslim publics, support is high among both Lebanese Sunni (25%) and Shia (51%) populations, although it is much more pervasive among the latter. Although still troublingly high, support for suicide terrorism in Lebanon has declined considerably since this question was first asked in 2002, when 74% endorsed these types of attacks. Over time, support has also dropped sharply in Pakistan. Just five years ago, 41% of Pakistani Muslims said suicide violence against civilian targets is often or sometimes justifiable, but today only 5% agree with this view. Only four years ago, nearly six-in-ten (57%) Jordanian Muslims believed these attacks could be justified, compared with 12% now. Jordan is the only country in which support declined between 2008 and 2009 – in the last year, the percentage saying they can often or sometimes be justified has fallen by 13 percentage points. A different pattern has emerged in Nigeria, however. Support for suicide bombing among Nigerian Muslims has increased by 11 percentage points since 2008, rising from 32% to 43%. There has been little change in Indonesia, Turkey or Egypt, although support was already relatively low in each of these countries. 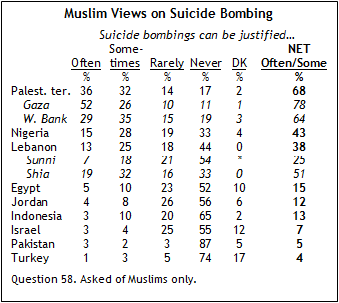 Approval of suicide attacks is also low among Muslims in Israel – only 7% say they are often or sometimes justifiable. 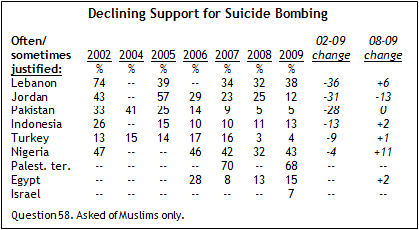 As with suicide bombing, support for Osama bin Laden among Muslims has declined in recent years. In Indonesia for example, in 2003, roughly six-in-ten Muslims (59%) said they had confidence in bin Laden to do the right thing in world affairs; today, only 25% agree. Confidence in bin Laden has dropped significantly in Pakistan as well, plummeting from 52% in 2005 to 18% in the current poll. In just the last year it has dipped 16 percentage points among Pakistani Muslims. Positive views of bin Laden have also become less common among Jordanian Muslims during the last four years, falling from 61% to 28%. However, confidence in the terrorist leader has ticked up in the last year, rising 9 percentage points. Among the Muslim publics included in the study, ratings for bin Laden are highest in Nigeria (54% confident) and the Palestinian territories (52%). Even so, support for bin Laden has declined over time among Palestinians, dropping 20 percentage points from 2003 to 2009. There has been a similar decrease among Israeli Muslims – 33% had confidence in bin Laden in 2003, compared with 16% today. In Turkey, almost no Muslims (2%) express support for the al Qaeda leader. Confidence is in the low single digits (4%) among Lebanese Muslims as well. Despite the many tensions between Lebanese Sunni and Shia Muslims, both sides agree in their assessment of bin Laden – only 5% of Sunnis and 2% of Shia voice confidence in him. The rise of Islamic extremism is a major concern in nations with substantial Muslim populations. Among the eight countries where the question was asked, majorities in seven say they are very or somewhat worried about the rise of Islamic extremism around the world. This includes 76% of Pakistanis and 70% of Indonesians, as well as more than six-in-ten in Lebanon (69%), Jordan (66%) and Egypt (63%). In Nigeria 60% are concerned, up from 52% in 2008. About half (51%) of Palestinians are very or somewhat concerned. Turkey is the only nation in which less than half (43%) are worried about extremism, although concern is up modestly since last year. There is also considerable anxiety about the rise of Islamic extremism within the survey countries themselves. In Pakistan, where the Taliban and other radical groups have controlled the Swat Valley and other areas of the country within the last year, 79% are worried, up seven percentage points from last year. Roughly half (52%) of Pakistanis say they are very worried. Similar levels of concern are found in Lebanon, and are common among all three of the country’s major religious groups: Christians (84%), Sunnis (77%) and Shia (72%). Roughly six-in-ten (62%) Egyptians are worried about Islamic extremism in their country, although this is down from 72% last year. Again, less than half of Turks (47%) are very or somewhat concerned, although anxiety about the threat of extremism has risen slightly in the last year. Similarly, less than half of Jordanians (44%) are worried about this threat, a decline of 17 percentage points since last year’s poll.